All types of rowing programs can benefit from a Still Water Teaching Barge. Novices of any age can arrive at the dock and in minutes be on the water with an oar in their hands. No need to introduce boat handling on the first day. People with physical challenges can board more easily and enjoy the stability provided by the dual hulls. Varsity coaches can get in the boat with their athletes and provide hands-on adjustment when a concept just isn’t communicating through the megaphone. Corporate team-building consultants have long recognized how rowers must work together. With a pair of barges two rag-tag groups could be racing as teams in an afternoon. Our barges are easily assembled on the water from three types of sections. 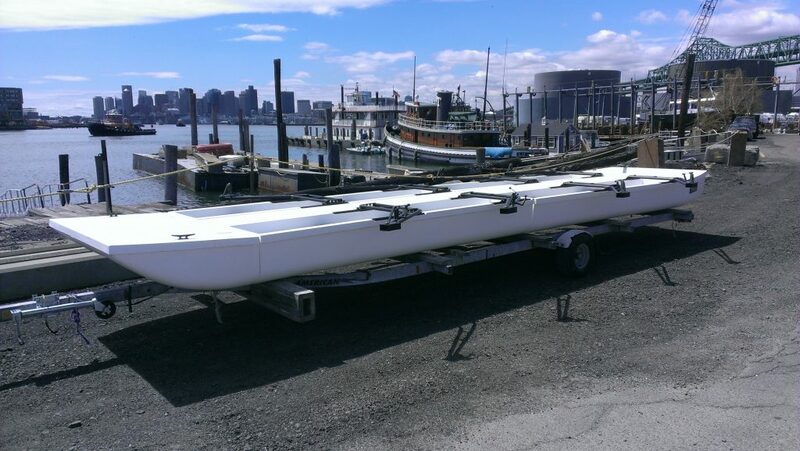 This most basic barge consists of a bow section, a four-seat rowing section, and a stern section. The stern section has an all stainless steel rudder. A transom for a small horsepower outboard can be added for positioning the vessel without rowers. Barges can be assembled with up to three 4-seat rowing sections for a total of 12 seats. The sectional nature allows a barge purchase to be spread out over several seasons as programs grow and needs change. When not in use barge sections can stacked out-of-the-way in a 10’6”x6′ footprint. The rigging on the barge is a bit unconventional. The footboards are fixed Concept 2 Flexfeet. Adjustment through the pin is achieved by having an adjustable wing rigger. The wing adjusts in its tracks with camlocks that require no tools. Wings can also be easily removed for docking at higher (non-rowing) docks. Please call or email us for the latest pricing, modifications, and developments! We’ll happily answer your questions.